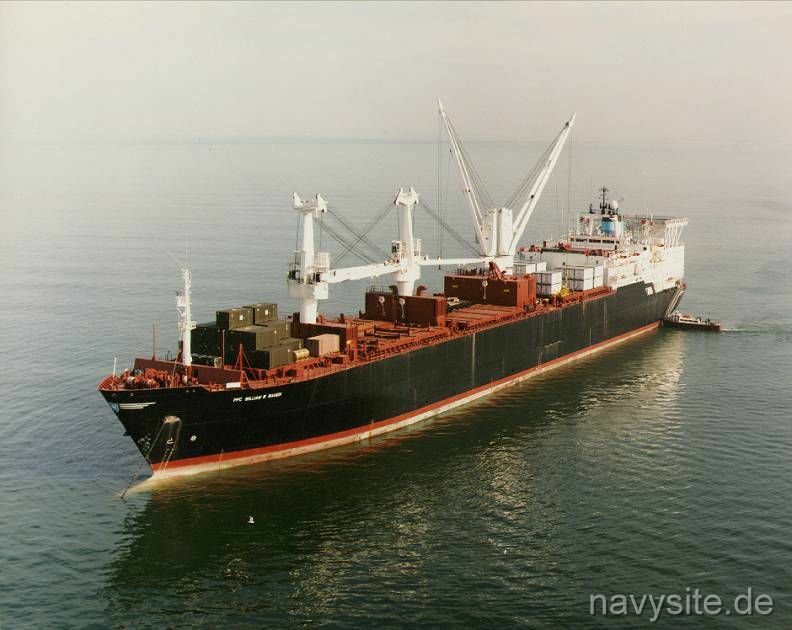 Built as commercial container ship ELEO MAERSK in 1979, the ship was purchased by the Maritime Administration (MARAD) in January 1983 and subsequently entered the Bethlehem shipyard at Beaumont, Tx., for conversion to a maritime prepositioning ship. 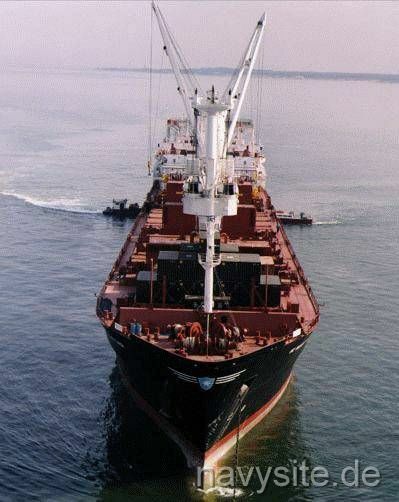 The conversion was finished in October 1984 and the ship entered service as MV PFC WILLIAM B. BAUGH becoming the first ship in the Navy to bear the name. The PFC WILLIAM B. BAUGH was operated by Maersk Line and assigned to Maritime Prepositioning Squadron 2 at Diego Garcia. On July 15, 2008, the ship was returned to Maersk Line and entered civilian service as MAERSK TEXAS. Conversion yard: Bethlehem, Beaumont, Tx. This section contains the names of sailors who served aboard MV PFC WILLIAM B. BAUGH. It is no official listing but contains the names of sailors who submitted their information. MV PFC WILLIAM B. BAUGH is named in honor of US Marine Corps Pfc. 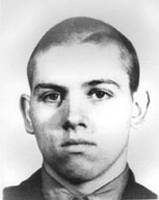 William B. Baugh who was posthumously awarded the Medal of Honor for his actions during a nighttime enemy attack against a motorized column en route from Koto-Ri to Hagaru-ri, Korea, on 29 November 1950. For conspicuous gallantry and intrepidity at the risk of his life above and beyond the call of duty while serving as a member of an Anti-Tank Assault Squad attached to Company G, Third Battalion, First Marines, First Marine Division (Reinforced), during a nighttime enemy attack against a motorized column en route from Koto-Ri to Hagaru-ri, Korea, on 29 November 1950. Acting instantly when a hostile grenade landed in his truck as he and his squad prepared to alight and assist in the repulse of an enemy force delivering intense automatic-weapons and grenade fire from deeply entrenched and well-concealed roadside positions, Private First Class Baugh quickly shouted a warning to the other men in the vehicle and, unmindful of his own personal safety, hurled himself upon the deadly missile,thereby saving his comrades from serious injury or possible death. Sustaining severe wounds from which he died a short time afterward, Private First Class Baugh, by his superb courage and valiant spirit of self-sacrifice, upheld the highest traditions of the United States Naval Service. He gallantly gave his life for his country. Back to Cargo Ships List. Back to ships list. Back to selection page. Back to 1st page.